They take the same approach when it comes to bonus and promotional options. 5Dimes offers free play, match play and lotto rewards, reload rewards, cash back rewards, super saver rewards, point mover special rewards, casino rebates, a free payout and on the house rewards program but perhaps their most unique offering is their reduced juice rewards. 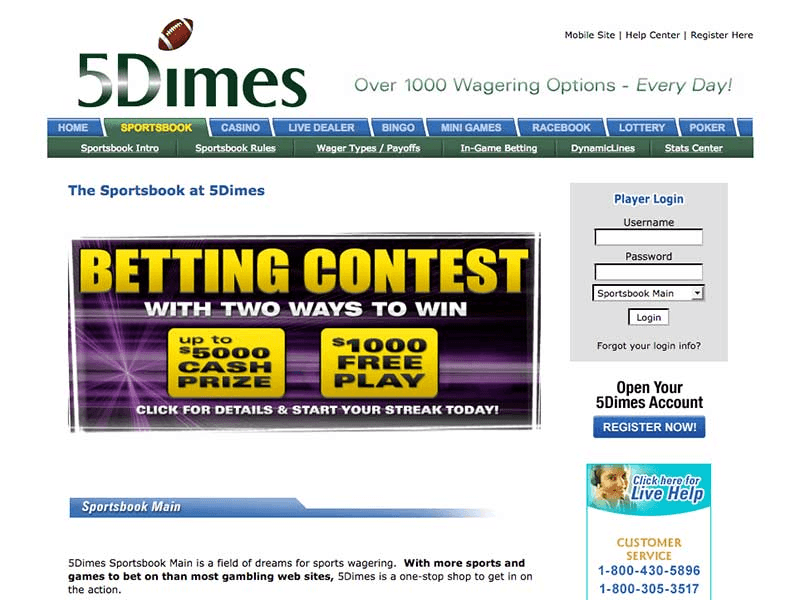 New players at the 5Dimes sportsbook can choose from among several reward options upon signing up for their service. Each new account is automatically defaulted to the 5Dimes reduced juice rewards program but if different bonuses, cash back or any of their numerous other rewards offers are more to your liking, you may switch your account to any of those offers. To make any alterations to your account in relation to rewards offers, you can contact the 5Dimes customer service personnel to check on whether you are eligible for the desired changes. When you opt to go with 5Dimes as your online sportsbook of choice, options are definitely the name of the game. There are a plethora of bonus offerings and rewards programs to choose from that are instantly at your disposal. You can go for their most popular promotion, the reduced juice offering on such sports as the NFL, NCAA football and basketball, CFL, NBA, WNBA, MLB, PGA, MMA, tennis and boxing. There's also a 50 per cent new player rewards program offering as much as $520 in free play rewards. You can access their 50 per cent casino match play reward, their lucky lottery promo, or their cash back rewards program. There are also super saver programs, point mover special rewards, casino rebates and free payout rewards. Like we said, the opportunities are plentiful at 5Dimes. Is there a better option in the mind of the bettor than the offering of less juice on their bets? The people who run 5Dimes don't believe so. When you take into account the hundreds, perhaps even thousands of bets that can be laid over the course of a year, the amount of savings that can be had is significant. 5Dimes generally offers a five-cent reductions in juice on bets on the NFL, NCAA football and basketball, CFL, NBA, WNBA, MLB, NHL, grand slam tennis, PGA golf, boxing, MMA, and numerous special events. That means if you'd normally need to bet $110 to earn $100, with 5Dimes you only need to wager $105 to win the same amount. Limits for reduced juice promotional lines range from $1 to $500 and are available for internet wagering only and only on straight bets. With 5Dimes, new player deposits from $100 to $400 will receive a 50 per cent free play reward, up to a total of $200 in free plays, and if the deposit amount exceeds $400, and is up to $2000, it will also qualify for an extra 20 per cent free play reward. This free play reward will be credited to your account incrementally based on the amount you have wagered. Wager one time and the deposit amount and 10 per cent of the reward will become available. Once you have wagered your deposit amount twice, another 10 per cent of the reward becomes available, and so on. By the time you have rolled over your deposit 10 times, the last 10 per cent of your reward will be available for use. 5Dimes offers reload awards in free plays that are gauged to the amount of your reload, up to a maximum of $500. The reload deposit must be between $100-$2500 and the free play reward is equal to 20 per cent of the reload amout. For example, reload deposits between $100-$249 garner a reward of $40 in free plays. These free play rewards will be credited to your account incrementally based on the amount you have wagered. Wager one time the deposit amount and 20 per cent of the reward will become available. Once you have wagered your deposit amount twice, another 20 per cent of the reward becomes available, and so on. By the time you have rolled over your deposit five times, the last 20 per cent of your reward will be available for your use. Play in the Sportspools, Casinos, Lotto900/9000, Racebooks, Live Betting Ultra, Live Betting Extra and the Poker Rooms does not qualify towards earning this free play reward. At 5Dimes, they offer a cash back rewards program that can put anywhere from 5-20 per cent of your losses back into your account. You can receive a 20 per cent cash back reward on all of your total losses twice per year. This cash back may be requested within two weeks of the first pre-season NFL game and within two weeks of the Super Bowl. You can instead opt for a 15 per cent cash back payout on your losses once every 30 days. Another option is a 10 per cent cash back payout on your losses that can be requested each Tuesday This cash back reward can only be requested on Tuesdays from 9 a.m. until 11 p.m. ET. If you choose to ask for a cash back rebate on any day other than Tuesday, you will receive a five per cent cash back offer. 5Dimes likes to boast that they offer their players incredible value with the best ofdds and their Super Saver offer, featuring a 30 per cent discount on their lines, is ideal for the bettor who likes to play parlays. This instant discount not only offers a 30 per cent pricing discount, but also enables amazing expanded parlay payouts, and is available to be utilized of the vast majority of wagers offered by 5Dimes on almost every sport they carry. This promotion must be chosen through the customer service department at 5Dimes and is only available on internet wagers. On straight wagers, parlays and teasers, the 5Dimes point mover special provides added perks to all of these bets and allows you to get the line you want at a better price. Teaser players can get the most out of their bets with an extra half point on all teaser plays during the NFL season. Point buyers can buy points and save with discounted odds for spreads and totals of all basketball and football offerings applicable to straight and parlay wagers. The Point Mover Special Reward Program is a promotional offer, and you must subscribe to it via 5Dimes customer service in order to have the proper account settings applied. This promotional offer is available on internet wagers only. When you get to the moment of making your eighth deposit with 5Dimes, they will take care of it for you. And they will also cover your ninth deposit as well. And the winnings accumulated from either deposit can be redeemed immediately. To be eligible for this promotion, you must have made seven consecutive deposits since registering for the program. You must have lost the full amount of those previous seven deposits to get the eighth deposit on the house. And you must lose the full amount of the eighth deposit to qualify for the ninth deposit on the house. With the 5Dimes free payout rewards program, you can withdraw your winnings without any fees. The free payout reward program allows you one free payout, any processing day of the week, every 30 days. The free payout reward equals up to a $40 discount depending on the method of withdrawal chosen. Regardless if you have cashed out or not during the past month, once a month you may request to be paid without being charged for it. If you choose the Free Payout Reward Program, no other promotional offers are available or valid. 5Dimes offers up to $125 in MatchPlay to use in their MatchPlay Casino. The amount of the reward is based upon your first deposit and the deposit must be between $50-$250. Every single dollar you wager in the MatchPlay Casino goes toward earning your new account MatchPlay reward. You must first wager 10 times your deposit amount in the MatchPlay Casino to receive your reward. You can also opt to receive a 33 per cent MatchPlay reload reward to use in their MatchPlay Casino. The amount of your reload reward is based on 33 per cent of the amount of your reload. The reload deposit must be between $100 – $333. There is no minimum deposit requirement for any 5Dimes bonus program. The limit on the 5Dimes reload deposit is between $100-$2500 The 50 per cent new player rewards program offers a maximum of $520 in free play rewards. There is a 10x rollover on the 5Dimes free play rewards program. The 5Dimes reload rewards program requires a 5x rollover. Close Visit 5Dimes and see for yourself... Ok! Let's Check Out 5Dimes!